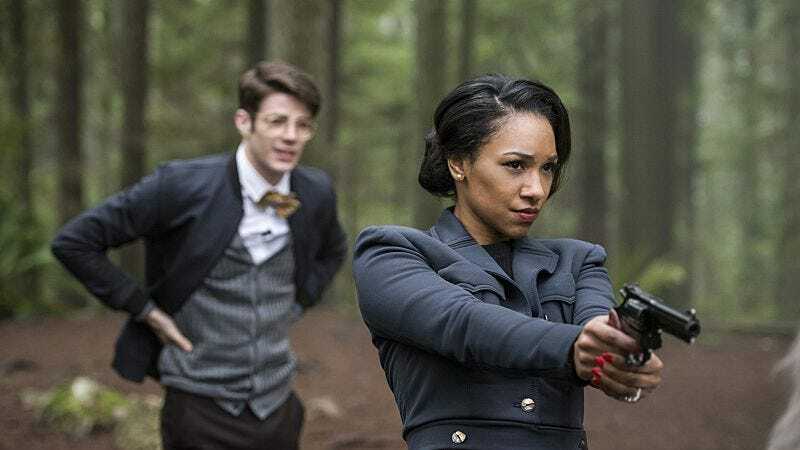 It doesn’t come as much of a surprise that The Flash packed most of the fun of this visit to Earth-2 into last week’s episode, leaving “Escape From Earth-2” to do the heavier lifting. We’re almost two-thirds of the way through this second season, so it was about time for Zoom to graduate from fleeting, scary cameos to full-fledged Big Bad status. Judging from social media, more than a few fans were expecting the reveal of Zoom’s identity tonight, but although the episode feinted in that direction, it didn’t happen. Unless it did. “Escape From Earth-2” left a trail of breadcrumbs, but the final scene appeared to wipe it clean. The first suspect removed from the board is the Barry Allen of Earth-2. Barry-2 awakes from his nap to a flurry of exposition from Cisco, who recaps last week’s events before Zoom shows up in search of Harry Wells. Grant Gustin goes just a wee bit overboard with his Nerdy Allen performance in these early scenes, as if he’s auditioning for a Scooby-Doo cartoon (I was half-expecting him to stammer “g-g-g-ghosts?”), making it a little hard to believe the Iris of this world ever fall for him, and yet all too plausible that Joe West would have no time for him. Barry is still locked up and unable to work up enough speed to phase through the Earth-2 vibrational frequency of his cell. The mystery man in the iron mask is unable to speak (or at least be heard), but Barry and Jesse eventually figure out that he’s tapping in a code used by prisoners of war. The only word they make out is “J-A-Y,” as in Jay Garrick, and that’s where things get interesting and a little weird. Just as I was trying to recall whether we’d ever seen Jay and Zoom in the same place at the same time, however, the end of the episode appeared to answer the question pretty definitively. With Frost’s help, Barry and Jesse escape their cells, and with nowhere else to go, Harry and Jesse travel to Earth-1 with the rest of Team Flash. Just before the breach closes forever, Zoom reaches through and vibrates his hand through Jay’s chest, yanking him back across the breach with him. So let the speculation begin (or, rather, continue). Is the man in the iron mask the “real” Jay Garrick of Earth-2? Is “our” Jay from some other world? Are either of them the Jay of Earth-1, known as Hunter Zolomon? Is Zoom none of the above? “Escape From Earth-2” works better as a piece of the puzzle than a fully-realized episode. 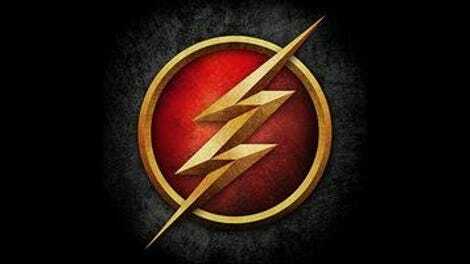 It has its moments—Barry-2 working up his courage to the point where he’s able to successfully give his super-powered alter-ego a pep talk, for instance—but it’s too disjointed and choppy to pack the punch of the best Flash episodes. Some of it hardly works at all: the subplot about Earth-1 Iris doing a news story on Jay is barely there, although I’m sure her Flash-skeptic new editor Scott Evans will become a thorn in her side/potential romantic interest in the weeks ahead. Zoom remains a fearsome figure, but we’re still no closer to knowing what he’s truly all about. Everyone sure let Barry off the hook pretty easily after he screwed things up so badly last week. It’s not fair to blame him completely for the death of Earth-2’s Joe West, but he certainly shares the responsibility and no one called him on it. Iris-2 didn’t even seem all that upset about the whole identity-switch thing (which, while amusing for us, was a big waste of time from the point-of-view of the characters who had only 48 hours to rescue Jesse and get back to Earth-1 before the breach closed). Of course Geomancer waltzes right into STAR Labs. I thought they’d taken care of this revolving door policy, but apparently not. I guess the scaling of the “cliffs of insanity” wasn’t in the budget for this episode. We got Cisco’s Jaws reference last week, and now we get a full-on Jaws parody in the form of a trailer for next week’s King Shark episode. I approve.